Large soft eyes with heavy duty chafe protection are lightweight and accommodate any size shackle or hook. Bright orange polyester cover provides excellent visibility and protects the line from dirt, sand and chafe damage. Heavy duty cordura chafe guard gives extra protection when wrapped around trees or rocks as a winch anchor. Velcro rope strap makes storage convenient and easy. Just because you have a winch on the front of your off road vehicle doesn’t mean you’re prepared to tackle any recovery situation. If you want to wheel hard and make it back home at the end of the day, you need to carry the right recovery gear. Enter the MacGyver Rigging Line. Designed to be the multi tool of vehicle recovery, the MacGyver Line can be used in a variety of ways to recover a stuck vehicle. No matter the situation, odds are the MacGyver Line can make it easier to get your rig unstuck and back on the trail. The MacGyver Rigging Line is the multipurpose tool of vehicle recovery gear. 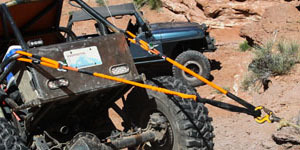 Designed for winching, the MacGyver Line can be used in a variety of ways to recover a stuck vehicle. Need an extra 10’ or 20’ to reach that winch anchor? MacGyver to the rescue. At the core of the MacGyver Rigging line is synthetic rope made with genuine Dyneema SK75 fiber. This is the same fiber we use to make winch lines, so you know it’s strong enough to handle the rigors of winching. If you’re off road adventures take you in terrain with a lot of trees, you know how valuable they can be as winch anchors when the going gets tough. 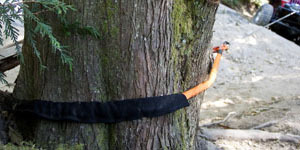 A common winching mistake is to wrap a winch line around a tree and and hook back to itself. Not only will this damage your winch line, but cause serious damage to the tree as well. The MacGyver is the perfect solution to safely anchor a winch line to a tree without causing damage to the environment or your gear. For those that wheel in areas without trees, large rock formations are usually the best winch anchor. 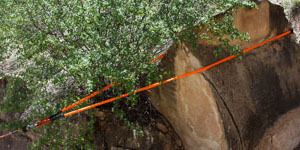 Most strap style tree savers are too short to reach around large rocks and wrapping a winch line around a rock will damage it. The 20’ MacGyver Line has the reach you need and has chafe protection to protect against sharp edges and rough surfaces that can damage your winch line. 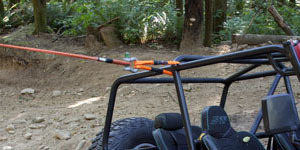 The MacGyver can used as a rigging bridle by attaching to two recovery points on your vehicle and winching from the center of the MacGyver line. This reduces stress on the vehicle chassis and recovery points and helps keep the vehicle lined up correctly while winching. In some recovery scenarios, such as a rollover, the prefered vehicle recovery points aren’t a viable option. Sometimes you need to winch off a rock slider, roll cage or axle. The MacGyver Line allows you to safely attach to these points on your vehicle without damaging your winch line or the vehicle itself. 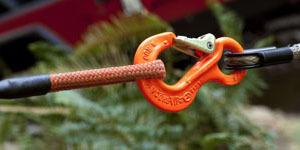 Click the button below to add the MacGyver Rigging Line | Tree Saver | Winch Extension - 10' to your wish list.